I’m jotting down a few things about the Middle East and global energy demand/ security that occurred to me while writing of the briefing books for the Doha Energy Forum on energy efficiency, solar and other alternative energies. By the way, if you come across any good reports/ papers on these subjects, please send them my way. Thanks! It seems to me that the American society (and Western media in general) is so fed up with talking about “Iraq” that you hardly see that country been mentioned any more, even in relation to energy. While it’s fine to tune this out in a lot of other contexts, it’ll be a huge mistake to underrate it’s role in meeting the world’s energy demand and keeping the oil price stable. Last year, Iraq has risen to the second biggest OPEC oil producer, with crude export at 3 million barrels per day! This is essentially what has kept the global oil price stable in the past couple of years. The increase in U.S. domestic production helped, but if Iraq slips into a civil war (which looks more and more likely by the day, and as Brookings expert Ken Pollack said “the surprising thing is why Iraq is not in a civil war already”), U.S. domestic production growth is a drop in a bucket in the global energy market, and you’ll see oil prices soaring very quickly. 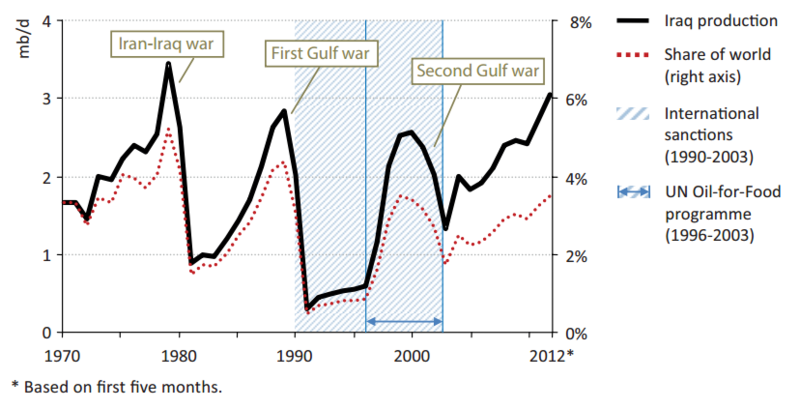 The rising violence and instability in Iraq is already causing its most export to waver. We’ve all seen discussions in the past year about U.S. rethinking its security interests in the Middle East as confidence in U.S. domestic production rose. And China is being described as a “free rider” in reaping the benefits of U.S. – provided shipping lane security. But the developments in Iraq reminds us that U.S. still has an intrinsic interest in Middle East security. The Iraq problem is not going away even if we turn our head the other way. Source: International Energy Agency, October 2012. GCC member countries (Qatar, Saudi Arabia, the UAE, Kuwait, Bahrain, and Oman) control 40% of the world’s known oil reserves and 23% of proven natural gas reserves. 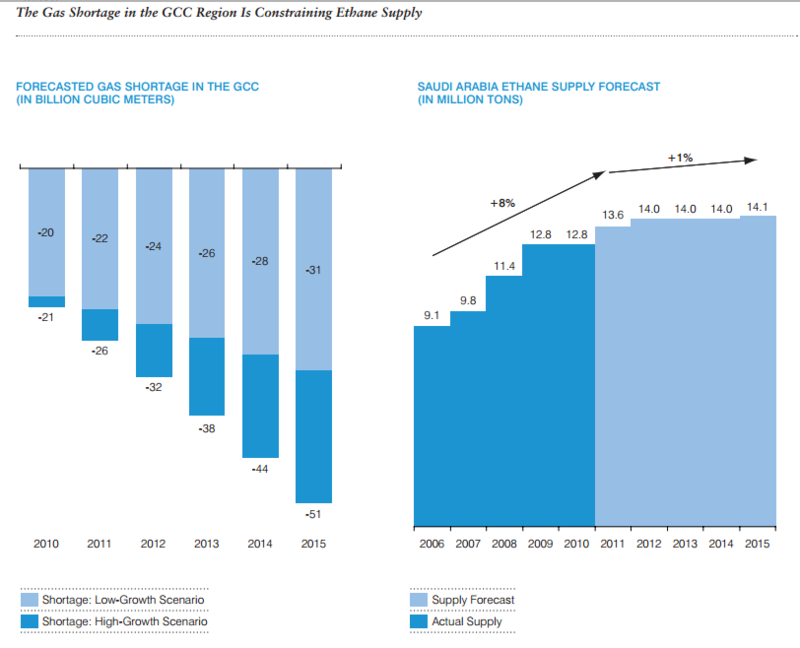 World dependency on GCC energy exports is expected to grow by 2020. As the global energy markets become more competitive (the entry of shale gas is a game changer here), GCC countries are looking beyond their current fossil-fuel riches and investing heavily in alternative fuels, and in oil and gas downstream industries. 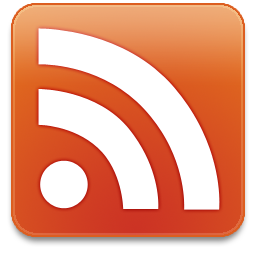 They are expecting their petrochemical, metal, all the industries where low-cost energy feedstock matters and corresponding service industries to grow in the next decade. 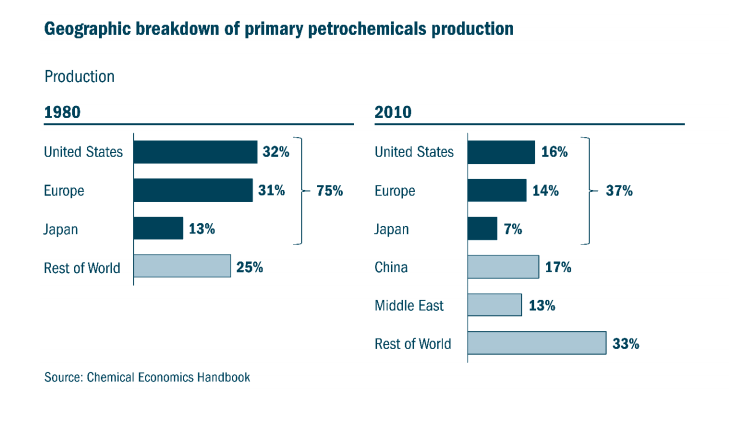 Recent regional natural gas shortage has constrained petrochemical industry’s strong growth sustained in the past two decades, yet GCC petrochemical players have adapted by switching to more liquid feedstocks. U.S. and Europe were the historical hubs for petrochemical industry, but this landscape has changed dramatically in the past 30 years. China is now the world’s largest consumer of polyethylene and ethylene derivatives. Driven by emerging market demand, petrochemicals are entering the strongest period of sustained demand growth seen in the past 20 years, Morgan Stanley forecasts. MG estimates that over the next five years, China and India together will increase their consumption of polyethylene by 10.5 million tons, equivalent to the current US consumption. As GCC increases their investment in adding value to fossil fuels, you will see even more closer cooperation between GCC states and China, and this will have significant geopolitical and security implications.